The Town of Worcester has been in the process of updating the local hazard mitigation plan and a draft is available for public review and comment. The Town of Worcester, VT 2017 Local Hazard Mitigation Plan is developed to recognize the hazards facing the community and identify strategies to reduce risks from these acknowledge hazards thereby reducing the loss of life and property during times of hazardous events. Having a local hazard mitigation plan allows Worcester to access state hazard mitigation grant funds and federal relief assistance for specific mitigation projects designed to reduce and/or eliminate vulnerabilities resulting from the occurrence of disaster events. Work under this plan update process is supported by the CVRPC and funded by a grant award under the Hazard Mitigation Grant Program. The Worcester Hazard Mitigation Plan will be reviewed by the Vermont Division of Emergency Management and Homeland Security prior to submittal to FEMA for final approval. Any comments received during the review process will be considered by the Board of Selectmen for inclusion into a final draft plan. Prior to FEMA approval, the Board of Selectmen must adopt the final plan by resolution. Prior to plan adoption, the Board will hold a public hearing to gain public comment. The adopted plan and certificate of adoption will be sent to FEMA and upon their review, FEMA will issue a formal Letter of Approval. The plan will be effective for five years from the date of FEMA approval at which time the plan will need to be updated and adopted again. 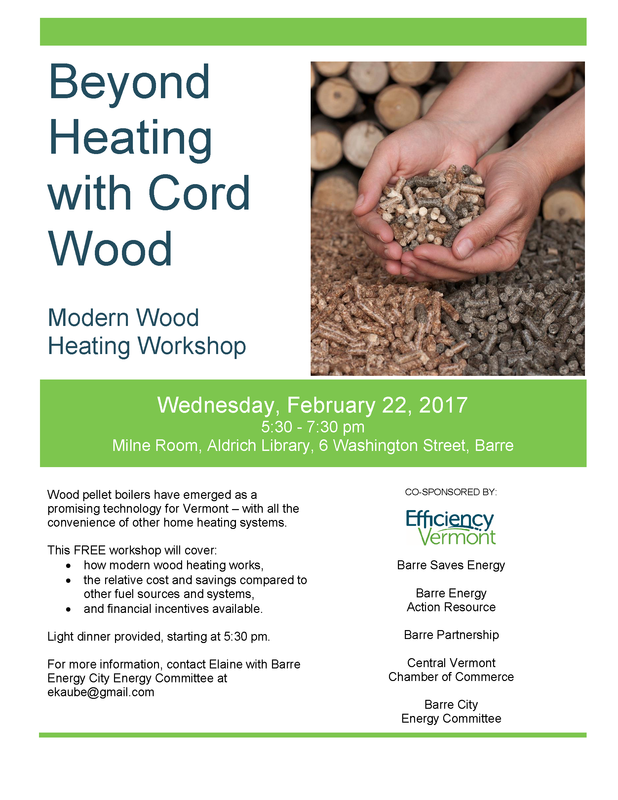 Beyond Heating with Cord Wood Workshop – February 22nd in Barre: Wood pellet boilers have emerged as a promising technology for Vermont–with all the conveniences of other home heating systems. This workshop will cover how modern wood heating works, the relative cost and savings compared to other fuel sources and systems, and the financial incentives available. The workshop will be held on February 22nd from 5:30-7:30 PM. at the Aldrich Library at 6 Washington Street in Barre, Vermont. The workshop will be led by Dave Keefe, Energy Consultant with Efficiency Vermont. 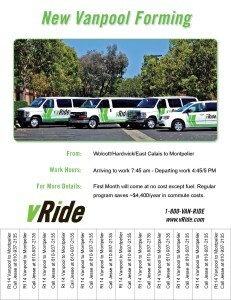 Wood pellet boiler distributors will be on-site to share information. Doors open at 5:30 pm. A light dinner will be provided. 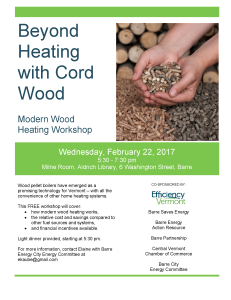 The workshop is co-sponsored by Efficiency Vermont in partnership with the Barre City Energy Committee. 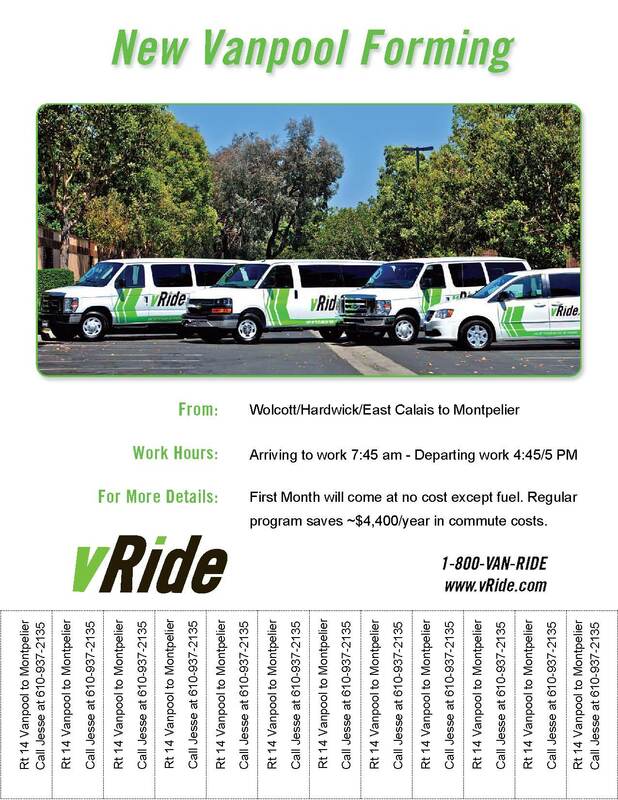 For more information, contact: Elaine Wang at 802-249-5978. As a reminder, the annual deadline for submitting the LEOP is from March 8th (day after Town Meeting) to May 1st. Please submit your plan to the Central Vermont Regional Planning Commission no later than the May 1 deadline. We will review the plan for completeness and forward it to DEMHS for acceptance. Municipalities with an approved adopted plan increase their rating under the Emergency Relief and Assistance Fund giving them access to greater grant funding in the event of a federally declared disaster. Many municipalities choose to enhance their local emergency operations plan with appendices. This year, DEMHS added additional appendices to the resource list found on their website. The use of appendices is optional and should be developed to meet the needs of the individual community. The CVRPC can help you identify which appendices would benefit your community and then help you develop them. The additional appendices identified in 2017 are as follows and can be found on the DEMHS website in both pdf and word format downloads. The appendices can and should be modified to meet your particular needs and situation. B8 Continuity of Operations Plan- This document assists local jurisdictions with planning for continuity events, including identifying essential functions, facilities, personnel, and resources. This template includes fillable charts and lists to capture the town data/information so that it is readily accessible and retrievable. B9 Evacuation Plan – This document assists local jurisdictions with planning for municipal evacuations, including access control & security, roles & responsibilities, and documenting available resources. (Courtesy of Local Emergency Planning Commission 6 – Windham Region). The RPC can assist with the development of evacuation route maps. B10 Debris Management Plan- This document assists local jurisdictions with planning for debris management, including identifying a Debris Manager, Debris Monitor, and Temporary Debris Storage and Reduction Site. Submission of this plan may make the municipality eligible for a one-time benefit of an additional 2% federal share towards eligible debris management costs during a federally-declared disaster. Of special note: During this 2017 submission cycle, if a town submits a Debris Management Plan (Appendix B10) to the RPC, the RPC must forward that plan to your DEMHS Regional Coordinator (Emily Harris). Once DEMHS has the Debris Management Plan, they will forward it up to FEMA for the potential one- time benefit noted above. C6 Shelter Inspections – This document provides information to local jurisdictions on how shelters will be inspected by the Division of Fire Safety during a disaster. Please be advised, Emily Harris, Vermont Department of Public Safety Division of Emergency Management and Homeland Security reachable by phone at 1-800-347-0488, is our regions DEMHS contact for LEOPs. Thank you and I look forward to working with you on your 2017 LEOP after March 7th and before May 1st. Your efforts last year gave our region 100% LEOP compliance, together let’s make 2017 a repeat.